Coarctation of the Aorta is characterized by a blockage (coarctation) in the aorta itself. This may consist of a narrowing of the vessel or a shelf-like obstruction within it (shown in diagram to left). The coarctation is located in the descending aorta, usually immediately past the point (further from the heart) where the subclavian artery (SA in the diagram) exits the aorta on its way to the left arm. 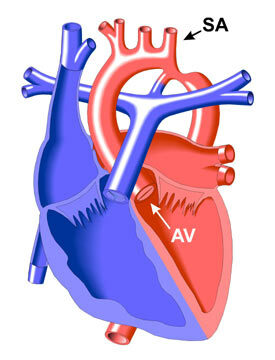 In some cases other left sided heart structures can be present. The aortic valve (AV), through which blood enters the aorta from the left ventricle, is commonly abnormally formed in this defect, with only two valve leaflets rather than the usual three (Bicuspid Aortic Valve). The mitral valve may also be smaller than normal resulting in narrowing of the valve to blood flow (Mitral Stenosis).